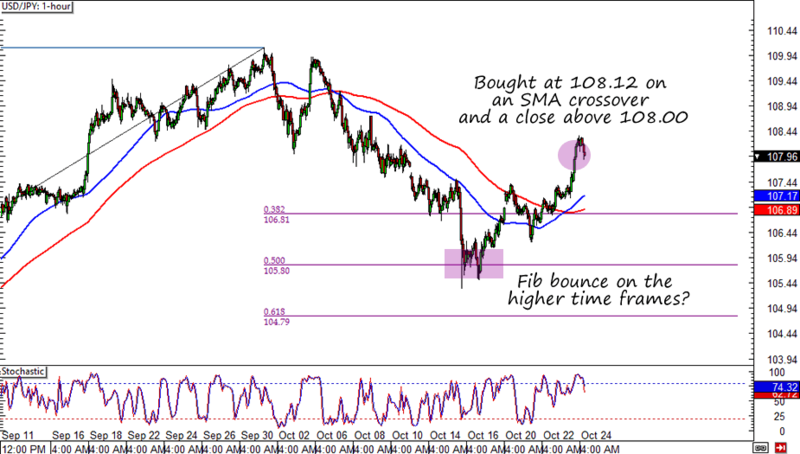 Forex Trade Idea: Another USD/JPY Uptrend in the Works? Is it just me, or is USD/JPY gearing up for another move higher? Here’s the forex trade setup that I spotted! As I tweeted yesterday, I bought USD/JPY at market as soon as the pair closed above 108.00. Aside from the break above a psychological level, I was also excited over the 100 and 200 SMA crossing over and signaling a possible start of an uptrend. The 1-hour chart shows us that the last two crossovers had heralded the start of strong trends this year (or at least in H2 2014). On the fundamental front, I was also alerted to news that U.S. equities traders are getting back their mojo. And with recent reports in the euro zone, the U.K., and New Zealand discouraging risk-taking, I’m pretty confident about the possible increase in dollar demand. The cherry on top of my USD/JPY trade idea is the possibility that the BOJ might soon have to consider adding more economic stimulus. A Wall Street Journal report said that thanks to lower oil prices, the central bank is now looking at Japan’s inflation possibly falling back below 1%. I risked 0.5% of my account at 108.12 with a 150-pip stop loss and an initial target around the previous highs (110.00 area). I’m manually trailing my stop and considering adding to my position if USD/JPY rises faster than I initially expect. What do you think of another USD/JPY uptrend? Are we just seeing a dead cat bounce, or is USD/JPY really ready for another move higher?